Oh yeeeees. We made our debut at the SEMA show in Vegas in 2016, and we brought this very special build with us. We’ll admit that we got a little carried away with this one — but in a good way. Our vision: Create a family-friendly beast that could take on the rigors of driving in the Colorado backcountry and on big-city freeways. The finished product is one part classic Land Cruiser, one part modified monster — a careful balancing act — one we DID NOT take lightly. Like all of our builds, this one began with a full frame-off restoration — we wouldn’t have it any other way. During the process, we made a few “basic” updates to the power steering, front disc brakes, heating and A/C. But that’s where the “basic” part of this story ended — and the fun truly began. For us, the party started when we replaced the original engine components with a much more capable, modern powertrain. Look under the hood of this FJ43, and you’ll find a 210-horsepower Toyota 1FZ engine (a 4.5L DOHC 24-valve inline 6) with Haltech Electronic Fuel Injection and a 5-speed manual transmission. Put that all together and you get the kind of power that inspires confidence — on the highway and the trail. 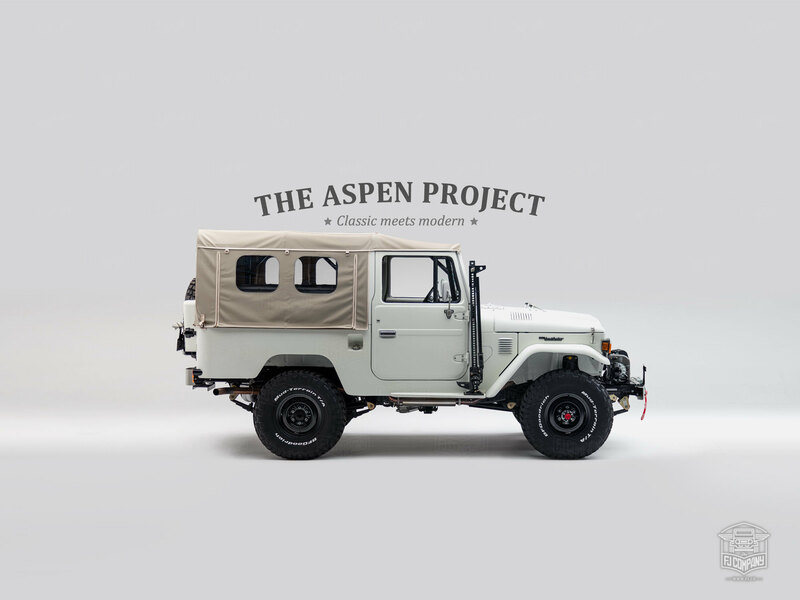 The FJ43 is already a design legend. Those bold fenders! That classic grille! ...all signs of an icon. So we kept its classic good looks intact and made a few tasteful updates. We added a fresh coat of matte white paint to the exterior which is offset by matte silver accents and Toyota OEM wheels in gunmetal gray. You’ll also find plenty of trail-ready parts and accessories — like a Warn 8274 winch mounted to the original front bumper along with a pair of PIAA 7" LED fog lights. And a custom roll cage was installed to ensure every joyride ends the way it begins — safely. The cabin of this FJ43 has been fortified with super-tough materials. The Recaro SPEED seats are trimmed in marine-grade upholstery, to match the door panels and fold-down rear seats. We also added a coat of Rhino Linings® bedliner to prevent scuff marks and rusting. Now, this all-weather, all-terrain 4x4 is ready for just about anything. Here, at The FJ Company, we take pride in building modern versions of the classic Land Cruiser. And this build is no exception. Here, we added just enough bells and whistles to satisfy the demands of today’s driver — a digital instrument cluster that provides information at-a-glance, modern LED interior lighting, and a premium sound system with integrated Bluetooth®, just to name a few. This landmark build was unveiled at SEMA 2016, where we also showcased our a custom-built FJ45LV and FJ40. The G40 Expedition by The FJ Company satisfies your need for adventure with a Toyota 1GR-FE engine and other modern upgrades. Build yours today!